It’s no secret that there TONS of great, low calorie yogurts on the market that are low in PointsPlus, and pretty tasty (Fiber One, Yoplait, Dannon…the list goes on). In fact, I have been a frequent user of most brands of these types of yogurts. At least I was. Until I found Wallaby Organic Yogurts. Available for a great price at most health food grocery stores (I get mine at Whole Foods Market or Henry’s/Sprouts for about $.99 each), they have no artificial sweeteners, no preservatives and taste WAY better than all the other brands that use an artificial sweetener to keep their calorie counts low. 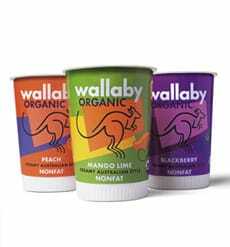 Each 6oz cup of the Wallaby Nonfat Yogurts have just 3 PointsPlus each. Granted, they may be a Point or two higher than the other brands, but you are getting a MUCH better tasting yogurt that has no artificial crap in it. Well worth it, in my opinion. Want to learn more about these tasty yogurts, keep reading, folks!